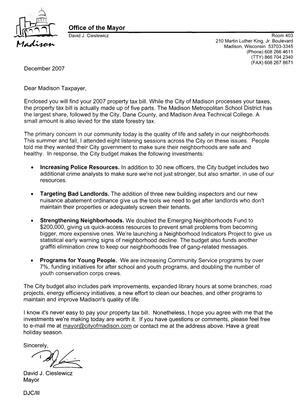 Recent news that Madison’s “total property values” top Milwaukee’s for the first time piqued my interest in the growing $38,220,758,479.00 federal taxpayer subsidy to organizations purchasing electronic medical records. Note that the $38B has been spent since 2011. 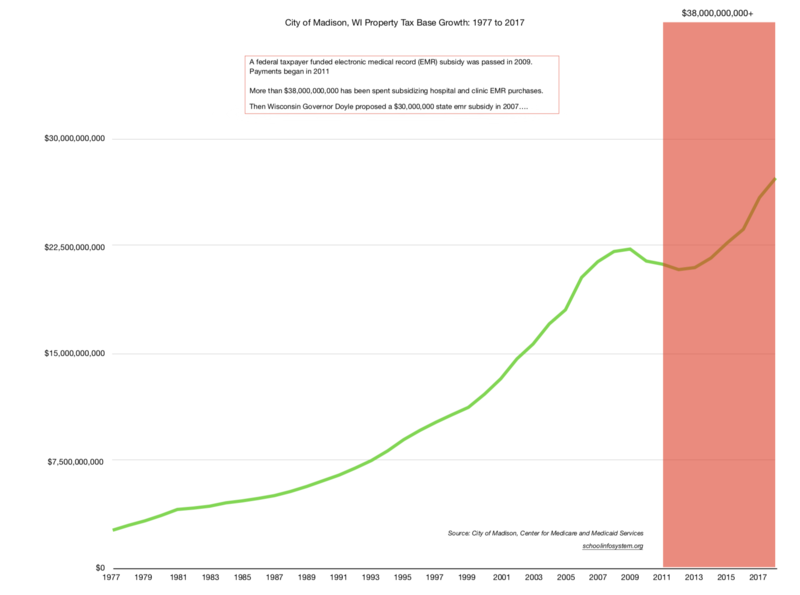 I created a chart illustrating Madison’s property tax base from 1977-2018 using data from the City Assessors office. I displayed the federal taxpayer $38,220,758,479.00 (growing) subsidy from the date of the first payment (May, 2011) through June, 2018. Tap for a larger version. How the Cleveland Clinic grows healthier while its neighbors stay sick . Why Americans are avoiding the doctor. Part of the company’s recent growth has stemmed from $30 billion in federal incentives included in the recovery act passed in 2009 during the financial crisis. The incentives were designed to give a final shove to hospitals and physicians to make the costly and difficult transition from paper records to electronic records. In 2008, only 1.5% of U.S. hospitals had a comprehensive system for electronic records implemented in all major clinical units, and an additional 7.5% had a basic system that included certain features in at least one unit, according to the results of a survey published in the New England Journal of Medicine. Even fewer physician practices had made the transition. By 2014, 75.5% of hospitals had at least a basic system, according to an annual survey. Before the federal incentives, academic medical centers, hospitals that were part of health systems and large physician practices were most likely to have begun the transition to electronic health records. Epic focuses on those customers. But the incentives have contributed to the surge in the company’s growth. That, though, has come at a price. Epic’s size and success have made it a target for critics of electronic health records and the way the $30 billion federal program has evolved. Critics contend that the systems are difficult to use, that entering information is time-consuming and detracts doctors from focusing on patients, that the records frequently are cluttered with unneeded information and that hospitals and physicians often can’t exchange information. In February 2009 the U.S. Congress unexpectedly passed the Health Information Technology for Economic and Clinical Health Act (HITECH). HITECH provides up to $27 billion to promote adoption and appropriate use of Electronic Medical Records (EMR) by hospitals. We measure the extent to which HITECH incentive payments spurred EMR adoption by independent hospitals. Adoption rates for all independent hospitals grew from 48 percent in 2008 to 77 percent by 2011. Absent HITECH incentives, we estimate that the adoption rate would have instead been 67 percent in 2011. When we consider that HITECH funds were available for all hospitals and not just marginal adopters, we estimate that the cost of generating an additional adoption was $48 million. We also estimate that in the absence of HITECH incentives, the 77 percent adoption rate would have been realized by 2013, just 2 years after the date achieved due to HITECH. President Obama and Congress poured $30 billion in taxpayer subsidies into the push for digital medical records beginning in 2009, with only a few strings attached and no safety oversight of the vendors who sell the systems. The move was touted as a way to improve patient care and help rein in medical costs. Five years later, the explosion in the use of the electronic records has created the potential for efficiencies and safety benefits but also new risks for patients, the scope of which still is not fully understood. But the scramble by doctors and hospitals to cash in on the incentives has thrust complex, balky, unwieldy, and error-prone computer systems into highly sensitive clinical settings at a record pace. From 2008 to 2013, the percent of US doctor’s offices with electronic health records rose from 17 to 48 percent. Growth in hospitals was even more dramatic, from 13 to 70 percent. Officials at Epic Systems are not commenting on a New York Times report Wednesday that the firm was central in lobbying Congress on a $19 billion “giveaway” (now $37B and growing) to convert all U.S. medical records from paper to computers. The stimulus package also included penalties for doctors who don’t adopt the new technology. Providers who don’t install electronic records by 2014 will face reductions in their Medicare reimbursements. 2007 Then Wisconsin Governor Doyle’s proposed $30,000,000 state EMR subsidy. There are serious dangers lurking behind the government’s $30 billion electronic health record (EHR) experiment. This omnipresent technology turns doctors into data clerks and shifts attention from patients to paperwork–while health plans, government agencies, and the health data industry profit. Patients who think the HIPAA ”privacy” rule protects the confidentiality of their medical information will be shocked to discover it makes their medical records an open book. I’ve found it curious that this far larger taxpayer subsidy has gone unmentioned when the $4B FoxConn subsidy has been tossed about within the political theatre. Enclosed you will find your 2007 property tax bill. 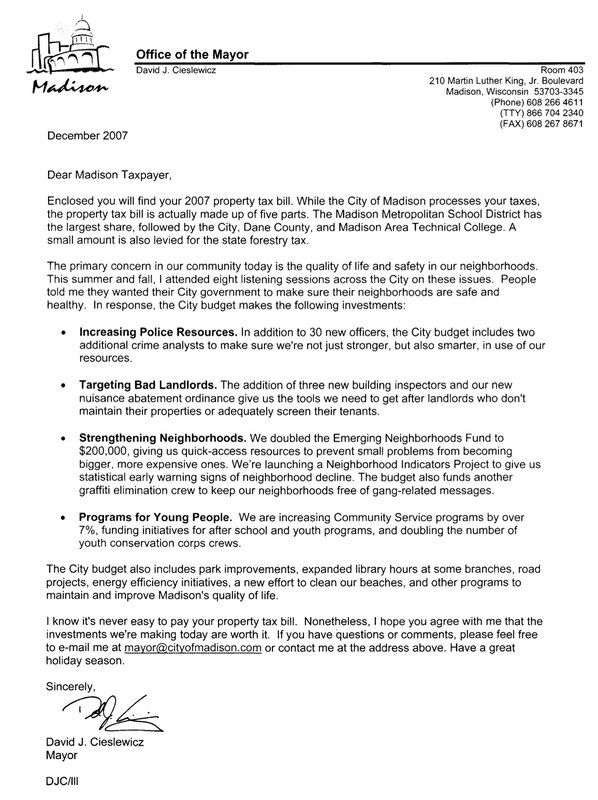 While the City of Madison processes your taxes, the property tax bill is actually made up of five parts. The Madison Metropolitan School District has the largest share, followed by the City, Dane County, and Madison Area Technical College. A small amount is also levied for the state forestry tax. Increasing Police Resources. In addition to 30 new officers, the City budget includes two additional crime analysts to make sure we’ re not j ust stronger, but also smarter, in use of our resources. Targeting Bad Landlords. The addition of three new building inspectors and our new nuisance abat ement ordinance give us the tools we need to get after landlords who don’t maintain their properties or adequatel y screen their tenants. Strengthening Neighborhoods. We doubled the Emerging Nei ghborhoods Fund to $200,000, giving us quick-access resources to prevent small problems from becoming bigger, more expensi ve ones. We’ re launching a Neighborhood Indicators Project to give us statistical early warning signs of neighborhood decline. The budget also funds another graffiti elimination crew to keep our neighborhoods free of gang-related messages. Programs for Young People. We are increasing Communi ty Service programs by over 7%, funding initiatives for after school and youth programs, and doubling the number of youth conservation corps crews. projects, energy efficiency initiatives, a new effort to clean our beaches, and other programs to maintain and improve Madi son’ s quality of life. These words are a useful look at the Mayor’s perspective on local taxpayers. Konkel says “we could have done this if we really wanted to,” referring to the failure of the hotel room tax hike, which she states would have brought the levy down to 4.03, also lamenting the failure of several amendments to provide services to the indigent. “I know how I’m going to vote,” Webber says, while Bruer commends the council for the tenor of this year’s budget process. “This administration unlike others in the past did more truth in budgeting,” he says of the mayors role, continuing by pointing out cost-cutting measures undertaken by city departments in his defense of the budget and its process. “To go through all those hours and all that energy,” Bruer says, “I have no problem going out to my constituency and defending this increase” due to its “balance” of attention. The tax hike, Cieslewicz said, is the third lowest in the past two decades. It’s now time for the state to back away from tax caps, let cities make budget decisions based on their own values, and for the state to try to fix how it funds municipalities, the mayor said. Ald. Zach Brandon, 7th District, who led the group that made the 4.1 percent tax cap pledge, offered the lone harsh words about the budget. Posted in Media, Politics, Taxes. Legislative Fiscal Bureau (via WisPolitics): Madison’s levy can increase (and therefore will) by 3.3% this year according to the Wisconsin Legislative Fiscal Bureau. This cap is the result of Governor Doyle and the Legislature’s Property Tax “Freeze”. The other part of the state where the property tax burden was high was Dane county, according to WISTAX. The city and town of Madison led the area with property taxes at 8.8% and 8.2% of income, respectively. Five suburbs surrounding Madison also made the top-50 list: McFarland and Mt. Horeb (both 7.4%); Sun Prairie (7.3%); and DeForest and Stoughton (both 7.1%). In a separate part of the report, WISTAX notes that the property tax-to-income ratio is much like a political “heart monitor.” When property taxes relative to income climb above 4%, discontent begins to grow. The study cited several periods in the postwar era when property taxes were unusually high and led to a major change, either in politics or in policy-making. Most recently, this occurred in 1993-94, when property taxes completed a 14-year rise, hitting 4.8% of income. Then, a bipartisan majority in state government imposed school revenue limits and first committed the state to providing two-thirds of local schools’ revenues. Aids to local governments increased dramatically since 1955, according to the study. Local school aids rose 10.8% per year, while shared revenues to local governments increased 4.9% annually. However, WISTAX researchers point out that there are questions about the long-term effectiveness of local aids for reducing property taxes. Economic research in Wisconsin and elsewhere finds that state and federal aids to local governments only partially offset local property taxes, as a portion of that aid funds new spending. The study finds that some limits on local governments have been effective at relieving property taxes and some have not. During the 1970’s, the state imposed cost controls on schools and levy limits on counties and municipalities. Due to an increasing number of “loopholes,” they were deemed ineffective and eliminated in 1983. Recent revenue limits on schools have been more effective, because they do not have similar loopholes. Counties and technical colleges have limits on the tax rates they can impose. However, large increases in property values have limited their effectiveness. But the two proposals are difficult to compare because the approaches are so different, Berry said. “From the perspective of local government, they would probably prefer Doyle; from the perspective of a fiscally strapped property owner, the Republican plan would probably be preferable,” Berry said. Though they don’t get much media attention, there are, in fact, some ideas out there worth pursuing, Reschovsky says. Beyond that, some states have tried assessment caps, with mixed results, Reschovsky says. The best example, of course, is California’s controversial Proposition 13, which was passed in 1978 and limits increases in assessed value to 2 percent a year. A house gets reassessed at full value only when it’s sold. Wisconsin Department of Revenue Tax Incidence Study – PDF full Study. The biggest bite to Wisconsin taxpayers comes from the property tax, which generates 41.7 percent of all tax collections, a new state study finds. But many lower-income property taxpayers are not using the credits available to save them money, the Department of Revenue report said. “Property taxes were regressive across all household groups,” the study says. The poorest 20 percent paid an average 5.3 percent of their incomes in property taxes, while the highest income groups spent an average of 4 percent of their incomes on property taxes. The state Department of Revenue report, released today, calls the system that collected $15.1 billion in state and local taxes in 2001 “mildly progressive across households.” Officials said the 2001 tax burden was studied because the tax code hasn’t been rewritten since and complete data was available for that year.